Hello friends, it’s Yvonne again! Hope you’re having a lovely day. It’s Friday so it’s gotta be good, right? 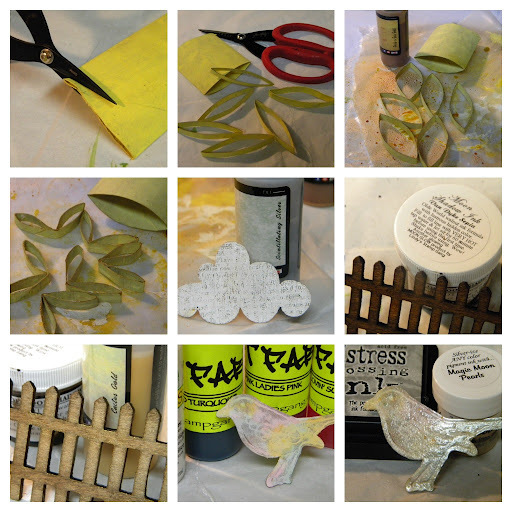 If you’re like me, you’re anxious to spend some time crafting this weekend! I was inspired by some interesting guidelines set forth in a challenge I was wanted to participate in. It required the use of a set of random items. 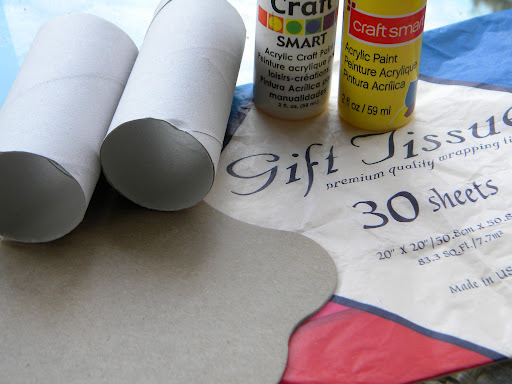 The items were as follows: a tp roll, acrylic paint, gift wrapping tissue (the kind you use to stuff in a gift bag,) and chipboard. Part of the requirement was that these items must be used, but you could add any other embellishment. 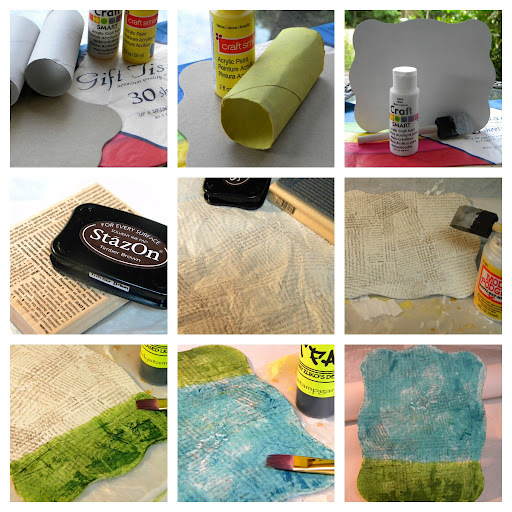 I’ve been totally intriged by all of the Mixed Media projects so many of our fellow crafters have been making, and figured this would be a good time to try. I’ve also been itching to try out the new Flat Fabios. The colors are amazing – so rich and vibrant! Well, I ended up using a TON of Lindy’s… starting with the Fabios and working my way through Moon Shadows, Embossing Powers, Glitz Spritz, and Starburst Stains! Woohoo!!! My fingers were so stained, I had to scrub then several times! 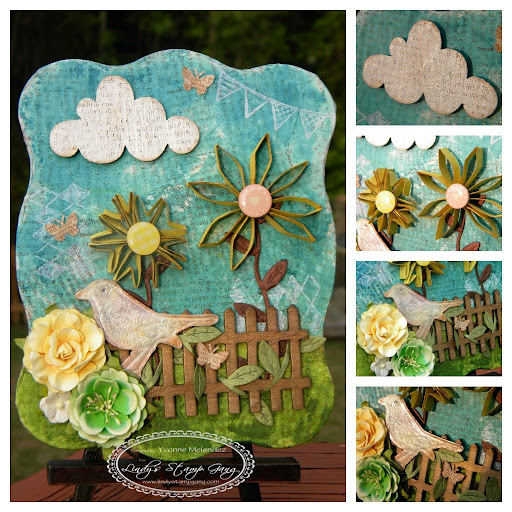 Once I prepared the chipboard to use as a faux canvas (lol!) I used colors from the Go Greased Lightnin’ Set, specifically I used Greased Lightnin’ Green & Danny Zuko Denim. Next, I prepared the items I wanted to lay on the chipboard. I used Grab a Guy Gold Starburst Stain on the painted tp roll, and I used it to make the flowers. The wood veneer cloud was painted white, sprayed with Scintillating Silver Glitz Spritz, and stamped with a dictionary print stamp. Moon Shadow Ink in Van Dyke Sepia was used to stain the wood fence, and then sprayed it with Catus Gold. The little chipboard bird has a base coat of white paint, and then a layer of several of the Beauty School Drop-Out Flat Fabio collection. For a finishing coat I embossed it with Magic Moon Pearls. 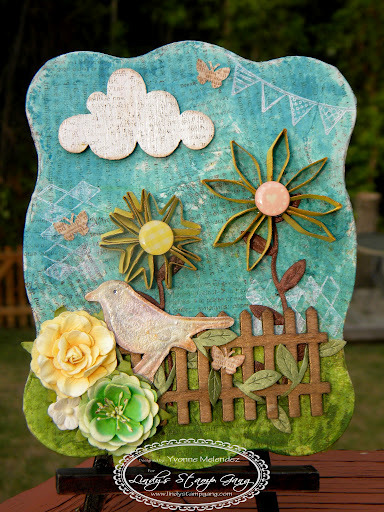 Last I added a few flowers, leaf ribbon, and tiny butterflies as finishing touches. And taa-daaaaa, one completed Mixed Media Faux Canvas completed! Yay!!! No wonder everyone’s making them – I had tons of FUN, and hope you’ll try and LOVE it! Well my friends, I hope you enjoyed today’s visit to our blog. Our hopes are to inspire you, motivate you to create, and share techniques & ideas. And of course, we love showing off our Lindy’s!!! Thank you so much for visiting! Hope you have a great weekend with lots of fabulousity! LOL!